MSU scores a goal to make it 1-1 and a little brawl ensues following the goal. 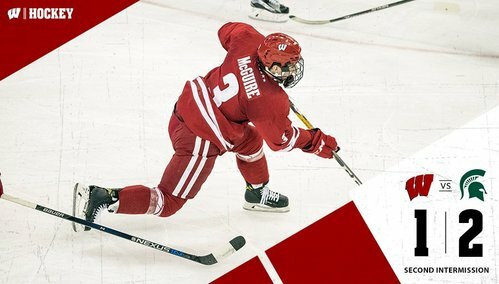 The @BadgerMHockey freshman J.D. Greenway lays down the law! Rhett Holland will get credit for the goal. Assists to Appleton and Gatt. 11:47 to go in the 2nd. JD Greenway has been ejected from the game following the fight after the Spartan's goal. It will be 4-on-3 hockey for now. 1-1 with 11:47 to go in the second. We'll play 3x3 for 2:00 and then the Spartans will have 3:00 of PP time. So Greenway gets 5 and a game for fighting, while MSU's Appleton gets 2 for roughing. Playing 3-on-3 for a while. Greenway's fighting major should come with a DQ, which would take him out for next Friday's game against Penn State. Grant Besse has a breakaway opportunity but he is denied. 25 seconds left in 3-on-3 hockey. Spartans now on an extended power play for three minutes. Lots of action going on in East Lansing! MSU still has a 5-on-4 advantage for 58 seconds with 7:45 left in the period. Back to 5x5 with 6:30 to go in the 2nd. Badgers kill MSU's 3-minute power play. 1-1 with 6:28 left in the second. Kill! UW finishes off the three-minute power play without allowing a goal. We are tied 1-1 late in the second. Through penalty or injury, #Badgers have been down to 5 defensemen for a significant part of all 4 games against Michigan State this season. SPARTANS GOAL: Joe Cox gives MSU a 2-1 lead over UW with a backhand off the post and in. Joe Cox puts the Spartans in front 2-1 with 4:09 to play in the 2nd. Spartans take a 2-1 lead with 4:09 left in the second. Ryan Wagner draws a tripping minor and the Badgers will look to pull even on the power play. The power play is cut short as Grant Besse is sent to the sin bin. It will be 4-on-4 for 1:05. MSU now on a power play for 55 seconds. 1:20 to go in the period. And now Michigan State's power play is done as Cullen Hurley is tripped up. It will be 4-on-4 for 46 seconds and then UW will have a PP. After 40 minutes, 2-1 Spartans. End 2: Michigan State leads Wisconsin 2-1 on second-period goals by Holland and Cox. Underway in the 3rd - 2-1 Spartans. Badgers start the period with 50 seconds of PP time. Third period is underway with UW down 2-1. Badgers have a shortened power play to start the third. 14:54 left in the third, and MSU still leads UW 2-1. Badgers have all three shots on goal in the third. 2-2. 13:02 to play in the 3rd. BADGERS GOAL: Trent Frederic scores his third of the weekend to tie the game 2-2 with 13:02 left. Badgers head to the power play with 12:41 to go in regulation. Momentum starting to swing back towards UW. Wisconsin man-advantage expires with nothing to show. 2-2 near the midway point of the third period. Thanks to all who participated in tonight's 50/50 raffle, sponsored by @msufcu . The winning number is L247338. The winner receives $1102 .50.